Looking for a Russian Toy Terrier? As the name suggests, the Russian Toy Terrier originated from Russia. Also known as the Russkiy Toy, it is one of the smallest dogs in the world. There are two types of coats: long and smooth (short) and the amount of grooming will depend on the type. As a tiny dog, it only needs 20 minutes of exercise daily. It remains a rare breed and is yet to be recognised by The Kennel Club. Do you feel like a Russian Toy Terrier can be a good pet for you? Read about its breed profile to see if your hunch is true. The Russian Toy Terrier is believed to have come from English-type terriers during the time of Russian Emperor Peter the Great in the 1700s. Also known as Russkiy Toys in other countries, these dogs were created as companions of the nobility and upper classes. Records show eight smooth-coated Russian Toy Terriers competed in a Saint Petersburg show in 1874. The breed became very popular until the early 90s and was a regular in dog shows, often winning awards. During the October Revolution of 1917, its popularity and numbers dwindled as it was associated with the aristocracy and gained a bad image. In fact, only one dog was shown in Saint Petersburg in 1947 and a small number of pedigree or purebred Russian Toys were left. Breeders decided to create a new type of Russian Toy Terrier from the remaining toy sized terriers, which had some of the old characteristics, along with new features such as a high head that is not wide, flat cheeks and round eyes. During the 60s, over 70 dogs joined an exhibition and the first standard was created. This adorable breed remained famous in its native country but not so much elsewhere. It only arrived in the UK in 2008 and although a breed club has been established, the Russkiy Toy is yet to be recognised by The Kennel Club. The Russian Toy Terrier is one of the tiniest dogs in the world. This adorable dog weighs 4 to 6 pounds and stands 20 to 28 centimetres. It has a distinctive high head that is small in relation to its body. It has a pointed muzzle, a nicely defined stop, a small nose, slightly pronounced cheekbones, and a perfect scissor bite. If you look at the Russian Toy Terrier, you will immediately notice its large round eyes, huge upright ears that are set high, and lean long neck. The Russian Toy Terrier can either be a long-coated or smooth-coated. Long-coated dogs have a long coat that is straight or slightly wavy with profuse feathering on their ears, legs and tail. This type has higher maintenance needs in the grooming front, requiring daily brushing to prevent matts and tangles. Smooth-coated dogs have a short, shiny and close-lying coat with no undercoat, which makes grooming very easy as it will only need a quick brush once or twice a week. Prone to tooth problems like most toy dogs, the Russian Toy Terrier’s teeth must be brushed daily, if possible. Its ears should also be checked for wax build-up and its nails trimmed to avoid uncomfortable overgrowth. Russian Toy Terriers are cheerful, alert, loving, and loyal family dogs. They may be tiny in size but they have a big heart and personality. They love hanging out with their owners and would be content in lazing around the couch. This breed does well in a small city apartment of families with a sedentary lifestyle. The Russkiy Toy may be a lapdog but as full-fledge feisty terrier, it can be territorial and protective of its owners, not realising how tiny it is. It is quick to bark when strangers are about, making it a good watchdog. However, it is never aggressive and would open up to people once it gets to know them. The Russian Toy Terrier is intelligent and willing to please, which make trainings easy. Tiny dogs are very easy to spoil because they are often treated as babies. Owners often let go of bad behaviours that are not usually tolerated in big dogs. It is important for trainings to start early and rules to be set out so it does not become a difficult dog. Because the Russkiy Toy is delicate and can easily be injured when handled roughly, it is better off to a family with older children that know how to handle dogs. It does well with dogs and cats it grows up with but care should be taken when introducing new pets especially large dogs. Owners need to know that even though breeds have predisposed temperaments in general, each dog is unique. There are many factors that develop its personality and abilities. Environment, training and socialisation can help shape up the overall characteristics of dogs. In short, humans have a say on how their pets would grow up. The Russian Toy Terrier should be fed high quality dog food specifically formulated for small dogs because it has different nutritional needs compared to medium and large dogs. The top ingredient should be animal meat (chicken, beef, lamb, or fish) and fillers like soy, wheat and corn should be avoided. The Russian Toy Terrier is a generally healthy breed that can live up to 11 years. However, there are some health issues it can be prone to such as tooth problems including teething issues as a puppy, Patella Luxation, Progressive Retinal Atrophy, and Legg-Calves Perthes Disease. The Russkiy Toy is lively and energetic and pretty much needs to be kept preoccupied or it can develop unpleasant behaviour. It needs at least 20 minutes of exercise per day so it can stay healthy and happy. Once its energy is drained, it will gladly relax on the couch. The Russian Toy Terrier is a tiny breed that is generally inexpensive to own. However, before we talk about the expenses one will spend when raising this dog, it is worth knowing that this breed remains to be rare outside of Russia so obtaining one can be challenging. Interested individuals need to register their interest to a breeder and be on a waiting list. Purchasing a well-bred Russian Toy Terrier can cost you around £400 to £500. Now for the expenses; new owners need to prepare the basic dog equipment so the new puppy gets comfortable. It will need a crate, bed, collar/leash, and toys, which will roughly cost £200. For food in its different stages, expect to pay around £20 to £30 per month. For veterinary care, the costs will set you back £800 a year to cover regular check-ups, vaccinations, and other preventive treatments. Lastly, an important cost is dog insurance, which will be around £20 for basic coverage. However, since costs vary depending on the company, your location and the dog’s health, do your research on the cheapest premium you can afford. 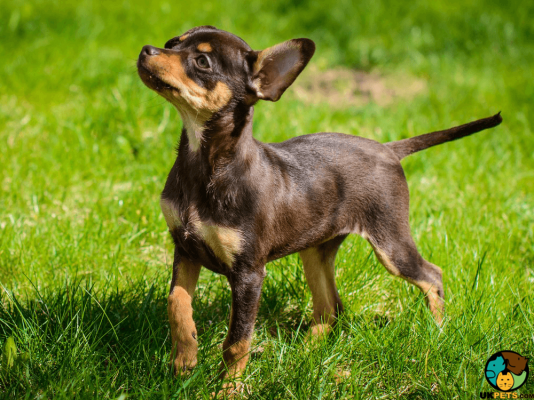 Is a Russian Toy Terrier Right for You? The Russian Toy Terrier is a tiny dog suitable for apartment dwellers. It needs to be fed a diet high in protein specifically formulated for small dogs. It only needs at least 20 minutes of exercise per day. It is a cheap dog to raise but obtaining one can be challenging because it is a rare breed. The breed is not yet recognised by The Kennel Club.